Diabetes cannot be cured, but it can be prevented. Below is information regarding prediabetes and how you can prevent the disease. Prediabetes is a condition in which individuals have blood glucose or A1c levels higher than normal but not high enough to be classified as diabetes. People with prediabetes have an increased risk of developing type 2 diabetes, heart disease and stroke. According to the American Diabetes Association (ADA), while these conditions can occur in people of all ages and races, diabetes is more common in African Americans, Latinos, Native Americans and Asian Americans/Pacific Islanders. Regardless of your age, race, or nationality, you may be at increased risk for diabetes or prediabetes. Take the CDC's Risk Test for Prediabetes or the ADA's Risk Test for Diabetes to determine your level of risk. With more than 86 million Americans living with prediabetes and nearly 90 percent of them unaware of it, the American Medical Association (AMA) and the Centers for Disease Control and Prevention (CDC) have joined forces to take urgent action to Prevent Diabetes STAT: Screen, Test, Act - Today. The American Medical Association (AMA) has teamed up with Centers for Disease Control and Prevention (CDC) to prevent type 2 diabetes and focus attention on prediabetes. Prediabetes is a serious health condition that increases the risk of developing type 2 diabetes, heart disease and stroke. 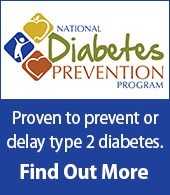 Evidence-based programs to address prediabetes can prevent or delay progression to diabetes. What can physician practices do right now? Start screening your patients for prediabetes to prevent diabetes before it starts and use the AMA/CDC diabetes prevention toolkit for health care providers to refer patients to Diabetes Prevention Programs.